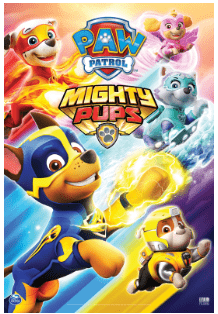 Cineplex Canada Family Favourites Movies Promotions: Paw Patrol: Mighty Pups Movie For $2.99/Ticket, Today at 11:00 AM! Good morning! Cineplex Canada Family Favourites Movies is here every Saturday 🙂 Join Cineplex on Saturday mornings at 11:00 am for Cineplex Family Favourites. Watch a family favorite film each week for only $2.99. A portion of the proceeds goes towards supporting WE Charity. It’s a fun and affordable way to enjoy the weekend with your family! Today, Saturday, March 9, 2019, at 11:00 am the film Paw Patrol: Mighty Pups.